Maryland is switching the focus of its oyster restoration efforts to a river on the Chesapeake Bay’s Eastern Shore known for its relative abundance of bivalves from a Western Shore waterway where they’re said to be lacking. The state Department of Natural Resources announced the Manokin River Wednesday as its new candidate for large-scale restoration, saying recent surveys of Breton Bay’s muddy and sandy bottom found no oysters, dead or alive. Low amounts of oxygen in the water and a lack of suitable bottom habitat cast further doubt on the prospects for successful restoration, officials said. The DNR had picked Breton Bay and the upper St. Mary’s River for restoration in December from a field of 12 candidates. Both are Potomac River tributaries in St. Mary’s County, across the Chesapeake from three waterways already undergoing restoration — Harris Creek and the Tred Avon and Little Choptank rivers. At the time Belton announced Breton Bay’s selection, some scientists and environmentalists raised questions about whether restoration would be feasible there. They noted that there had been little evidence of natural oyster reproduction in Breton Bay in recent years and suggested that rebuilding shellfish habitat could be costly and unlikely to succeed. 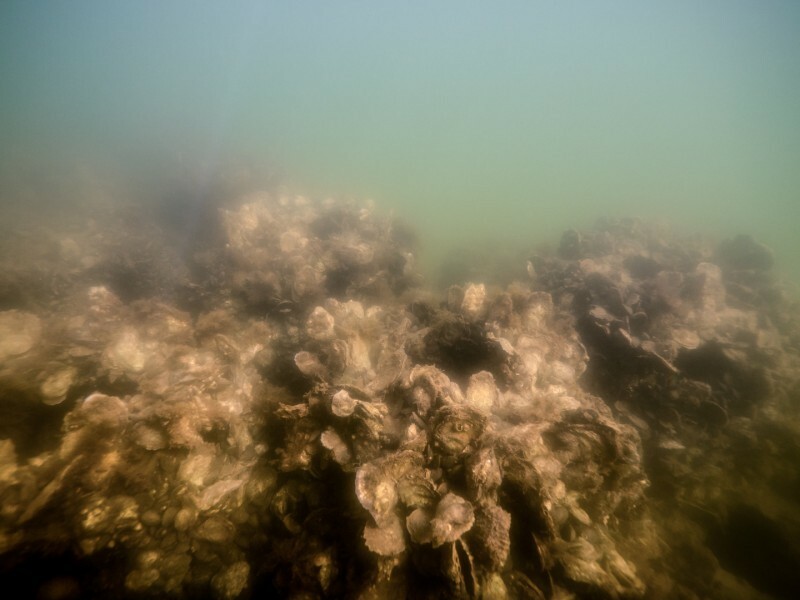 Belton said Wednesday that the DNR will move forward with the Manokin in Somerset County, pending approval from the National Oceanic and Atmospheric Administration and the U.S. Army Corps of Engineers, the federal agencies partnering with the state in oyster restoration efforts. As part of the federal-state Bay restoration effort, Maryland and Virginia each have pledged to rebuild oyster habitat and populations in five of their tributaries by 2025. Maryland has completed one — Harris Creek — with work ongoing in the Tred Avon and Little Choptank rivers. The Little Choptank restoration is state-funded, while the Tred Avon is mainly a federal effort. The Army Corps left oyster restoration funding out of its work plan this fiscal year, which ends Oct. 1. That has led to delays in completing the Tred Avon project. Environmentalists gave a qualified endorsement of the state’s switch to the Manokin, while the head of the state watermen’s association and local advocates for Breton Bay expressed disappointment. The Chesapeake Bay Foundation, for its part, has long pushed for restoring oysters in the Manokin. “With up to 800 acres that could be restored, it has the potential to significantly enhance both the Bay’s oyster population and the benefits that oysters provide,” said Alison Prost, the foundation’s Maryland executive director. The Manokin flows from headwaters near Princess Anne into the Chesapeake Bay on the northern end of Tangier Sound. After it was made a sanctuary and closed to harvesting in 2010, the Manokin’s oyster population reached its highest level in 20 years in 2015 and the number of diseased specimens dropped by more than half, according to the foundation. But Prost said she worries that since the state doesn’t plan to use federal funding – DNR officials didn’t provide a cost estimate – the restored reef could be reopened to commercial harvest in the future. The group is calling on Gov. Larry Hogan to place the waters off-limits to future harvesting. In originally selecting Breton Bay, the DNR secretary had said he hoped the federal government would fund restoration work there. DNR spokesman Gregg Bortz said in an email that department officials believe that “federal funds would be unnecessary (and unwarranted) in the Manokin as the tributary may be able to achieve oyster restoration goals and targets … with minimal investment from the state.” The DNR selected the upper St. Mary’s River for restoration for the same reason. Robert T. Brown, Sr., president of the Maryland Watermen’s Association and a St. Mary’s County resident, said he didn’t understand how the state could conclude oysters can’t grow in Breton Bay. He noted that he raises oysters on a patch of leased Potomac River bottom just outside of Breton Bay’s mouth. “I’m very disappointed that they’re not trying to help a place that really needs help,” he said. Liz Curtz, a leader of a watershed group pushing to improve Breton Bay, said she suspected that the DNR decision was driven by cost and the perception that restoration of the Western Shore tributary would have required what she called a “full-fledged investment.” She called the state’s switch a lost opportunity, noting community efforts are under way there now. “There are live oysters in Breton Bay and lots of local folks working to increase their numbers,” she said. An initial planting of oysters grown under a DNR program enlisting waterfront landowners “survived the summer surprisingly well,” she said, and a second round is set to begin of raising oysters at private docks for planting later in Breton. Fred Millhiser, another member of the watershed group, acknowledged that restoring oysters in Breton Bay would be a longshot, when compared with other Chesapeake Bay tributaries. But he argued it was worth a try, given Breton’s history as a productive shellfish area. Home to a dozen oyster shucking houses more than a century ago, they’re all gone now. Before the recent DNR surveys, state biologists had only made annual checks of a single oyster bar in Breton Bay, where in 2016 they found the bivalve population only slightly above average, with “low and intermittent” reproduction. Millhiser said he’d like to see the latest DNR survey results to understand the state’s rationale. Del. Charles Otto, a Republican who represents Somerset County, said he had mixed feelings about the state’s decision. It was a “tragedy” for commercial watermen when the DNR designated the Manokin a sanctuary, he said, because the county’s waters are some of the most productive for oyster harvests. Otto said his biggest concern is keeping the Manokin open to navigation. He pointed to the project in Harris Creek, where improperly installed granite reefs damaged boats and snagged crabbing gear. DNR officials say the Manokin restoration will focus on deeper waters to avoid navigational hazards.